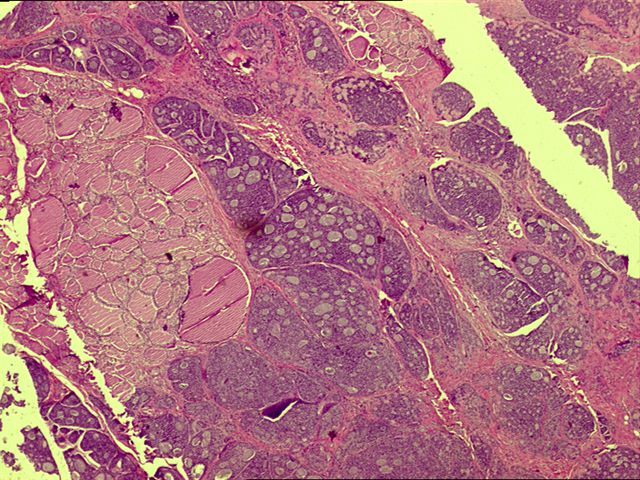 An elderly man had a central neck mass which was hard and fixed, and moved with swallowing.� He initially had a fine needle aspirate of the mass (figure 1, figure 2, figure 3).� This was followed by excision of the neck mass with the thyroid gland (histology images are below). 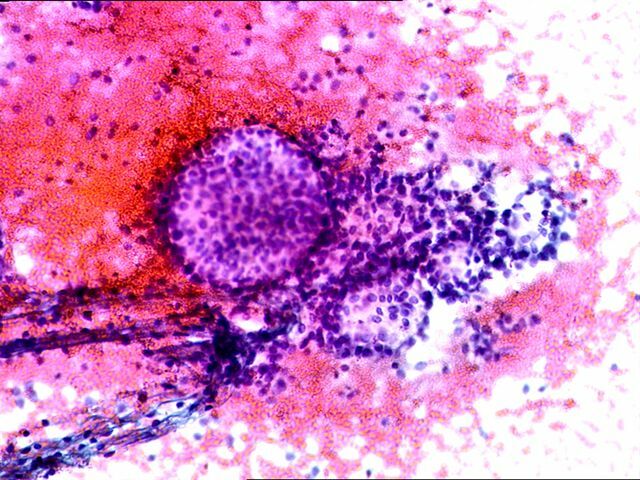 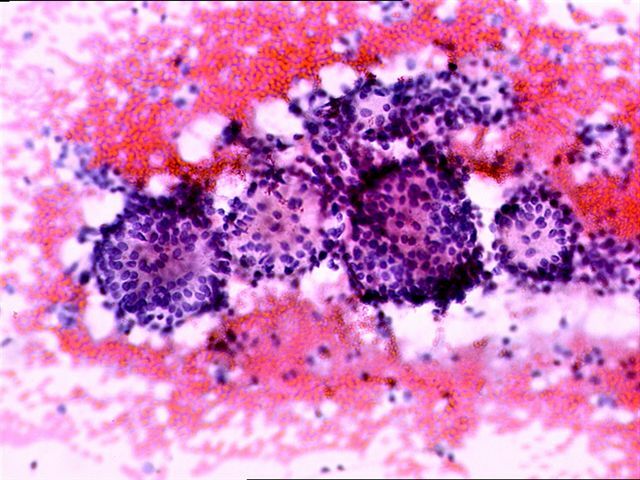 This case illustrates an unusual pitfall in aspiration cytology of the thyroid gland - the presence of an adenoid cystic carcinoma of the larynx or trachea that extends to the thyroid (Am J Clin Path 2004;121:551, Diagn Cytopathol 2004;30:115).� Typically, aspiration cytology of adenoid cystic carcinoma reveals a cellular specimen, with small uniform cells containing scant cytoplasm and dark but bland nuclei.� The cells are either arranged around or associated with acellular balls of homogeneous basement membrane material.� Histologic diagnosis, as in this case (from the resection), is usually not difficult (figure 4, figure 5, figure 6). 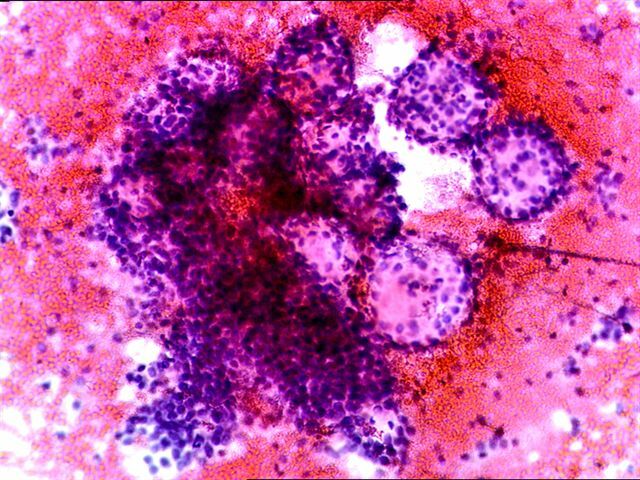 Adenoid cystic carcinoma is the most common minor salivary gland neoplasm of the larynx, although its incidence is still low (< 0.25% of laryngeal carcinomas), probably due to the sparse distribution of accessory salivary glands in this area.� It typically arises in the submucosal, seromucinous glands of the supra- or subglottic regions of the larynx, and exhibits extensive perineurial invasion.� The clinical course is typically long, but ultimately survival is poor with most cases reportedly being fatal. 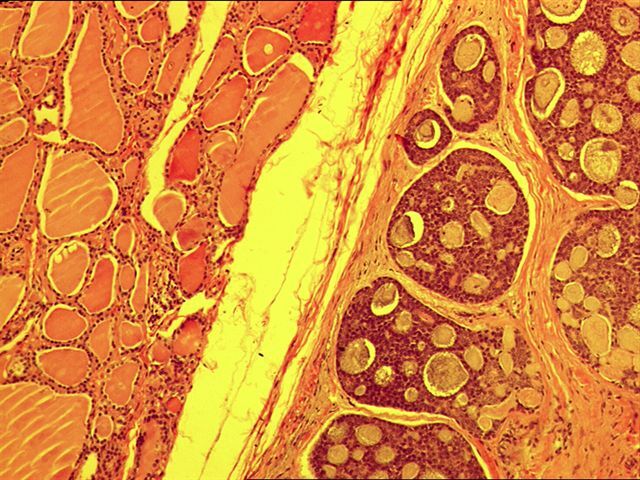 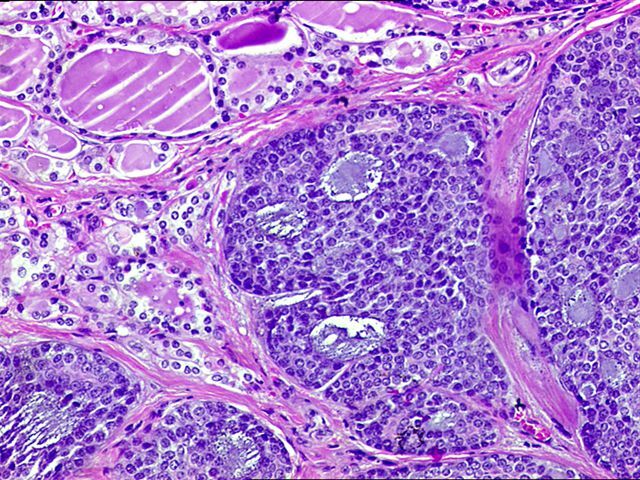 The high grade or solid subtypes may be associated with coexisting squamous cell carcinoma, which have an extremely aggressive course, and up to 40% mortality within one year.